Kunanyi/Mount Wellington has been watching over Hobart Town since day dot. No other capital in the country can boast a mountain and wilderness playground quite like this – just 20 minutes from the GPO. 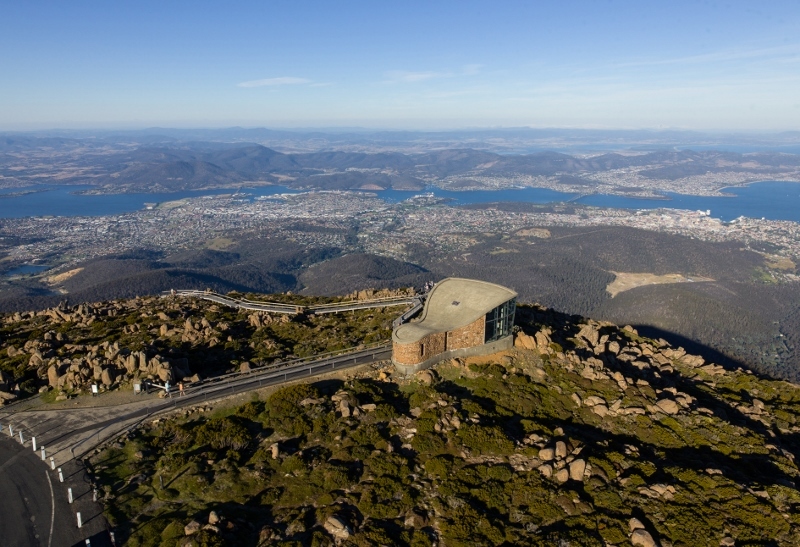 So pop your bags down at Lenna of Hobart, a heritage hotel in Battery Point and head for the peak 1271 metres above. It’s the perfect way to become acquainted with our city. The 21-kilometre drive to the mountain’s pinnacle is something else. As minutes pass and the city streets fade, temperate rainforest and sub-alpine flora come into play. Dolerite columns replace concrete and the air delivers that signature high-altitude freshness. Up top, let your eyes travel across a vista that takes in Hobart, the River Derwent, out to Bruny Island, the Tasman Peninsula and Southern Ocean beyond. But don’t just hit the viewing platforms, there’s plenty more to discover. Few know that there’s a 1930s skate rink up there and hidden huts only a handful of souls know about. Take your time on kunanyi/Mount Wellington and this peak will reveal her secrets. A stop at The Springs is a must on the way up. Here, you’ll find Lost Freight. When covered in a dump of snow, this re-imagined shipping container may well appear lost, but you’ll be glad they’ve landed halfway up the mountain. Their hot chocolate, coffee and sweet treats provide hearty fuel for long walks and mountain wandering. They might also help you out with locations of a secret hut or two. If you don’t have time to venture to the pinnacle, a walk out to Sphinx Rock is a great option. Relatively flat on a well-crafted trail, the stroll rewards with views of the Organ Pipes and a stellar city aspect. On this 2.7 kilometre walk, just near Sphinx Rock is an historic shelter known as Rock Cabin that’s well worth a detour for. If you’re curious about the ice-skating rink, it was built near the pinnacle around the time world war two was breaking out. If you pull into the long car park that is one stop before the summit, you’re within walking distance of it. We can’t give an exact geo-location, but do encourage you to walk up from the car park and off to the right….isn’t the intrepid journey half the fun? Happy wilderness wandering. A short drive will bring you home to Lenna of Hobart, your ideal Salamanca Accommodation and one of the leading hotels in Hobart.